Microsoft Office Communicator Mobile is a versatile Java-based unified communications client for Microsoft Office Communications Server 2007 R2. Communicator Mobile runs on Microsoft Windows Mobile 6.0 or higher which includes Pocket PC and smartphone devices. Nokia S40 series: Nokia 3120 Classic, Nokia 3600 slide, Nokia 5220/5310/5610 XpressMusic, Nokia 6212 classic, Nokia 6300i, Nokia 6301, Nokia 6500 classic, Nokia 6500 slide, Nokia 6600 fold, Nokia 6600 slide, Nokia 7210/7310/7510/7610 Super Nova, Nokia 7900 Prism, Nokia 8800 Arte. This month they released an important hotfix update for Communicator Mobile 2007 R2. 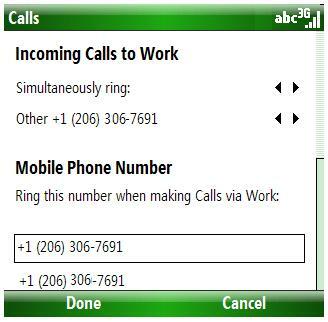 What's cool about Communicator Mobile 2007 R2 is that it enables users running the app on their mobile phone to make work calls using their corporate phone system leveraging "Single Number Reach" functionality. This allows you to use a single telephone number on your business card. With Single Number Reach, your desk phone and mobile phone will ring when an incoming call arrives. Importantly, outbound calling on your mobile device also gives the same caller identity regardless of whether you use a desk phone or a mobile phone. Another key advantage in Communicator Mobile R2 is that you can simultaneously sign in to more than one application at the same time and have multiple options for communication. In order to keep presence information up to date, the presence indicator now shows "Mobile" as an option for your availability, enabling people to easily keep track of your status. Apparently they've done some major overhaul to the code from the prior version since Microsoft said they optimized the performance and battery life is now improved by 350 percent. Fixes the problem in which AT&T FUZE devices that are set for a High-Speed Downlink Packet Access (HSDPA) connection cannot handle voice and data at the same time. In this situation, calls that use the Call via Work option fail unless the device is reverted to 3rd Generation (3G) by disabling HSDPA. 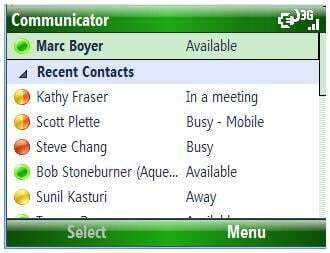 What's cool about Communicator Mobile 2007 R2 is that it enables users running the app on their mobile phone to make work calls using their corporate phone system leveraging \"Single Number Reach\" functionality. This allows you to use a single telephone number on your business card. With Single Number Reach, your desk phone and mobile phone will ring when an incoming call arrives. Importantly, outbound calling on your mobile device also gives the same caller identity regardless of whether you use a desk phone or a mobile phone. Another key advantage in Communicator Mobile R2 is that you can simultaneously sign in to more than one application at the same time and have multiple options for communication. In order to keep presence information up to date, the presence indicator now shows \"Mobile\" as an option for your availability, enabling people to easily keep track of your status. Apparently they've done some major overhaul to the code from the prior version since Microsoft said they optimized the performance and battery life is now improved by 350 percent. Provides home screen support for new home screens in \t\t\t\tWindows Mobile 6.5+ phones. Provides integration within the phone dialer for Windows \t\t\t\tMobile 6.5+ phones. Enables Communicator Mobile 2007 R2 to recognize when the \t\t\t\tphone is roaming and by default prevents Communicator Mobile 2007 R2 from \t\t\t\tsigning in to roaming networks. Provides additional support for joining conference calls \t\t\t\tfrom a Windows Mobile appointment. To do this, press Menu, and \t\t\t\tthen press Join Conference. Lets users log on by using a user name in the \t\t\t\tuser@example.com format, in addition to the domain\\user format. Enables the functionality by which callbacks are now \t\t\t\tautomatically accepted when the user uses the Call via Work option. Resolves the problem in which the Microsoft Installer \t\t\t\t(.msi) installation fails on a Windows XP Service Pack 3 (SP3)-based computer. \t\t\t\tIn this situation, users should install Communicator Mobile 2007 R2 by using a \t\t\t\t(.cab) installation. Fixes the problem in which AT&T FUZE devices that are \t\t\t\tset for a High-Speed Downlink Packet Access (HSDPA) connection cannot handle \t\t\t\tvoice and data at the same time. In this situation, calls that use the Call via Work option fail unless the device is reverted to 3rd Generation (3G) \t\t\t\tby disabling HSDPA.